Home » What causes hair loss in women? To understand why most women experience hair loss, its important to understand how hair grows and the cycles it has. It is also important to know that it is not uncommon to shed over 200 strands of a hair a day, with times, there is even more loss that does not result in thinning. In the simplest explanation, hair loss to the point of baldness is as a result of the hair’s cycles being disrupted, which in turn means that regular to substantial shedding is simply not replaced. The anatomy of hair growth. Hair, is as we know it, has an above the skin portion called the shaft, or strand, and a below the surface base called the follicle. The follicle is like a specially constructed tunnel from the surface of the skin down into its deeper layer. Inside the follicle, at the bottom, is where the root of the hair sits. Surrounding it are complex cell structures, glands, and blood vessels that all provide nutrition and support for the growing hair. The cycles of hair growth and loss. The basic cycles are labeled; growing (anagen), transitioning (catagen), and resting (telogen). During the growth phase, hair is actively growing and strands are becoming longer. It is the active phase in the life of the hair and lasts between 2 to 6 years. During the transition cycle, which takes about a week or two, the follicles shrink and changes. The hair is no longer able to grow and ceases to have blood supply for nutrients. During the resting phase that spans about a month to a month and one-half, the hair is simply there. It has reached its full potential and no longer has a deep root inside the skin. When a new root begins to form and the follicle is ready to begin the active phase again, the hair sheds away. Common causes for hair loss in women. For women, there are a lot of the same problems that men face as well. Despite popular belief that only men tend to suffer from thinning or baldness, 40% of reported issues are from female sufferers. There are several potential factors that can add up to specific reasons for female hair loss, some of them are even distinct from their male counterparts. Among the 30+ potential causes for temporary to permanent hair loss in women, giving birth, birth control medications, and PCOS are three distinct medical related factors that can result in sudden hair loss for women. Other causes include thyroid dysfunction, stress, and lifestyle choices, such as consistently wearing hair styles that put strain in the scalp. One of the best known cases for women to suffer from hair loss is when they’ve undergone treatment for cancer. A more in-depth look at the most common medical causes. Hormonal imbalance is one of the most common underlying issues that leads to baldness and thinning. When women are pregnant and then give birth, the hormones that may have caused an increased thickness in hair suddenly drop off and they end up in a hormonal crash. Hair may shed at an alarming rate due to the lack of stimulating pregnancy hormones. 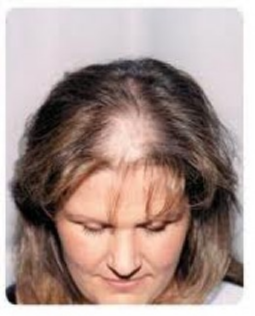 This sort of hair loss for women typically corrects itself in time, but can take up to two years to re-balance itself. This is also similar to the problems caused by birth control pills, where the temporary imbalance is from the drugs used to control ovulation. It is again, an issue that can correct itself on its own when you cease taking the medication, though the bounce back can take longer or shorter time than with pregnancy, depending on how long the medication was taken for. PCOS or PolyCsytic Ovary Syndrome is a lot more complicated situation of hormone imbalance that can be difficult to treat. This is a condition that still has many theoretical causes but there is a lack of a lot of hard evidence. The general condition is classified when a female’s body produces too many androgens, which results in a wide range of effects including hair growth in unwanted places and loss in others. Topical conditions such a ringworm on the scalp can cause temporary hair loss as well. It is a fungal infection which can destroy the follicles of the affected area and result in a distinct circle of baldness. Once properly treated with a special shampoo and or cream, the area will regrow hair once the fungus is cleared. Alopecia areata is a medical condition in which the body’s immune system mistakenly attacks its self, and can result in sudden patches of baldness. In rare instances, people suffering from this condition can loose all of the hair from their entire body. However, for most people, no matter how severe the instance, the hair loss is usually temporary and they will recover within a year or so of the incident. Lifestyle choices can be what causes hair loss in women. Lifestyle choices, such as wearing your hair tightly, or crash dieting can also lead to temporary or gradual but dramatic hair loss. Putting constant strain on your hair follicles can damage them to the point they are not able to recover. Tight braids that are close to the scalp, or tight long braids that pull all the hair in one direction can be damaging over time. It is good to let the hair down sometimes and to select styles that are follicle friendly. While pony tight ponytails all the time can be bad, they can still be worn when done so in moderation. If you keep your hair pulled up tight for work, be sure to let it down when you clock out so it has more time during the day relaxed than strained. Fat diets that have you cutting out most or all the protein and eating a lot of leafy greens or taking supplements that do not target enough vital nutrients can lead to temporary hair thinning and loss. Part of what can cause hair loss in women during these diets is the imbalance of protein and essential vitamins to healthy hair. The nutrients needed to produce hair include a healthy amount of protein, as hair itself is a type of protein called keratin. 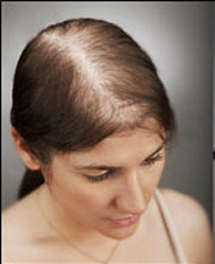 When you cease eating meats or other common sources of protein, it can result in thinning hair. An imbalanced diet can also cause lack of some viatmins and excess of others that create temporary hair loss. Lack of vitamins such as D and B while increase in A can cause thinning hair and baldness that is temporary while the imbalance exists. Other causes for hair loss in women and patterns. Beyond lifestyle choices and medical conditions, genetics can also play a role in what causes hair loss in women. Like men, women are also subject to genetic factors when it comes to hair loss. Having the markers that can produce baldness do not always mean there will be hair loss, but it can make women more susceptible to it when its caused by other factors. Also unlike men, women don’t tend to have a receding hairline in baldness, instead the parting line widens over time, or thins out from the part to either side. The typical loss of hairline and horse-shoe pattern baldness seen in males is rare in women. How to diagnose hair loss in women. When it comes to figuring out what may be the cause of thinning hair and baldness for women, a trip to the doctor is usually the best choice as a first step. Blood work and talking with your doctor or dermatologist can help you start with a clear picture of what is going on. They will look at your current and past health, your hormone and thyroid levels, and also examine other possible issues. Depending on the results of the the blood work, you may need hormone therapy or other medications to help correct the issue. They can also make recommendations about other things you can do, or products to try over the counter. Common hair-regrowth formulas sold in stores are not a proper treatment for all cases of hair loss, and can cause problems if applied to a scalp that does not need it. It can takes months or even years to diagnose, treat, and recover from hair loss. Instances where a cause is unknown. There are times that even with a doctor’s help, that a reason for hair loss cannot be discovered for sure. While it can be frustrating, it’s important to remember that emotional stress itself can contribute to hair loss. Sometimes when people focus too hard and fixate on a problem, they actually make it worse and can even skew the results of testing. A balanced diet, good health, and proper hair care along with good stress management can be all that is needed to see hair loss corrected. The most important factor though, in both diagnosing and treating hair loss is patience. It can take a lot of time to find what causes hair loss in women, and sometimes it can never be fully diagnosed, only treated with a variety of general lifestyle changes and medications.